Soco Falls is a spectacular double waterfall on the Cherokee Indian Reservation just off US-19 between Cherokee and Maggie Valley. 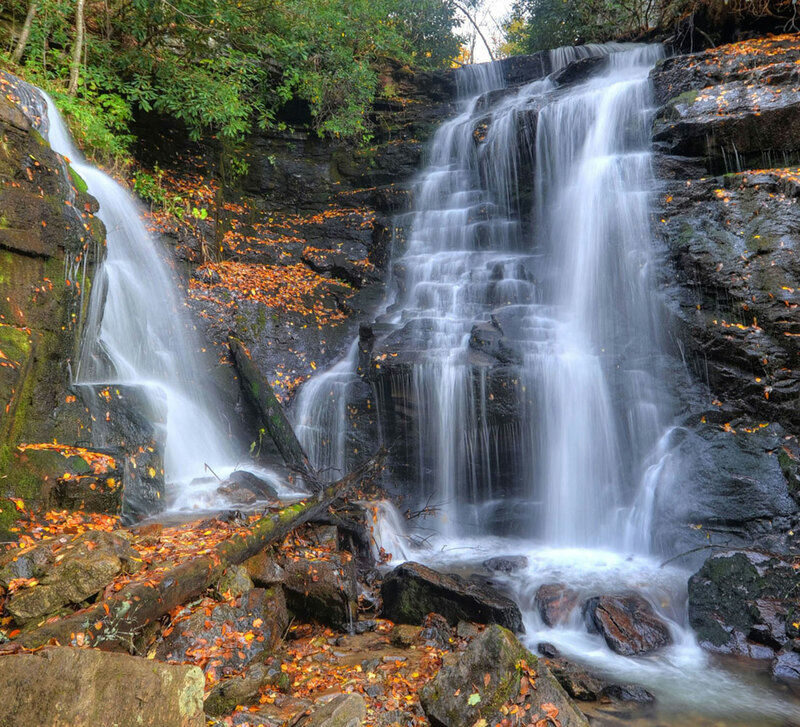 The falls are about 10 miles east of Cherokee and 5.5 miles west of Maggie Valley Maggie Valley. If you’re driving the Blue Ridge Parkway, exit at Soco Gap (Milepost 455.7) and go about 1.5 miles west on US-19 toward Cherokee. Driving the serpentine US-19 requires a driver’s undivided attention, which explains why it’s easy to miss the small blue sign that says “Soco Falls 1/2-mile ahead”. The little blue sign is all the notice you’ll get. There’s no sign at the falls. Just look for small roadside pull-off with space for maybe a half-dozen vehicles. A break in the guardrail leads to the trail and Soco Falls, a beautiful double waterfall where two separate creeks meet for spectacular 40 and 50 foot drops into a dark gorge. The short trail descends about 100 feet to a viewing platform and an excellent view of the falls. However, in the summer, foliage may partially block the view of the smaller falls and you may be tempted to scramble down the bank to get a better view from the base of the falls. But be warned, it’s extremely steep, slippery and not recommended. About every two weeks, you'll receive an email previewing our latest blog post and a link to the online story. We hope you'll enjoy our stories, but can unsubscribe at any time.